When Kate and I chose where to live in Perth it was all about what club we would join, we planned to trial a few, but once we tried Freo, that was it, the coaches were so friendly as were the athletes, it was a no-brainer. 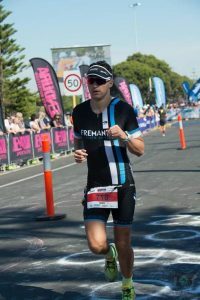 I really like the Left Bank triathlon, it was the first Tri I did in Australia, but Australia Day at Point Walter wins, the river swim, the great atmosphere, almost guaranteed good weather, and I quite like hills! Before I was a ‘triathlete’ I was an Alpine Ski racer. I represented Great Britain from age 12-18 before discovering beer. The two sports have little in common (other than Lycra), and Perth couldn’t be further from a ski slope, so watch out for me coming down Welshpool Road from Kalamunda, its the closest I get to skiing speeds.